This is an easy, healthy salad that we love. 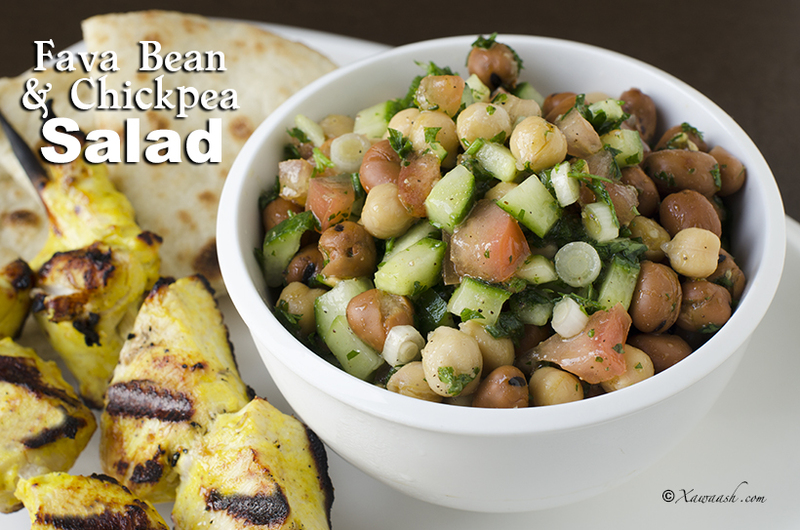 You can snack on it between meals, have it as a side, or have a bowl of it for lunch. 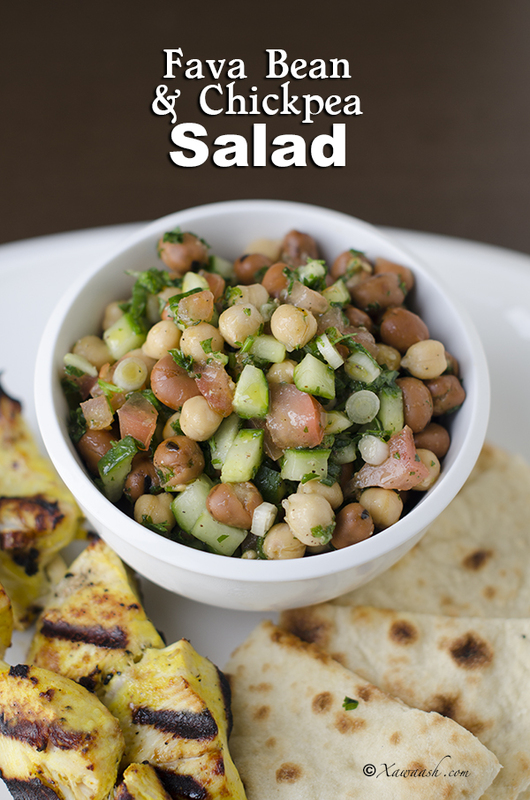 Most people do not associate healthy with delicious but this salad is yummy as well as healthy. 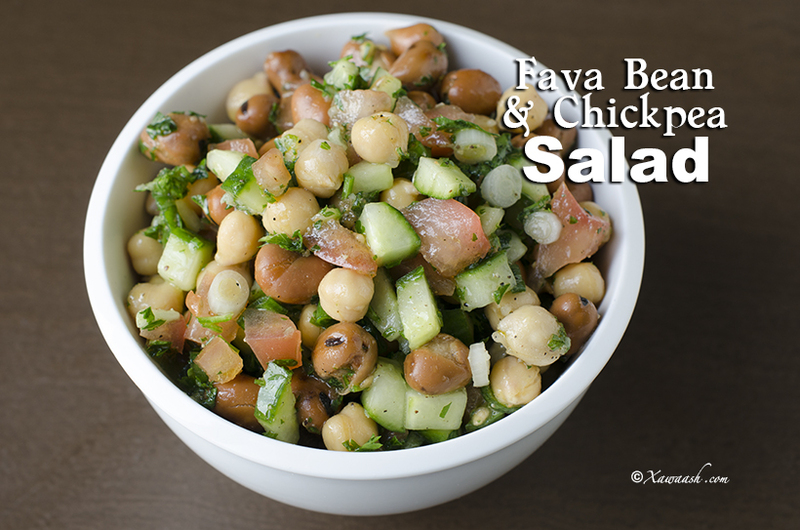 We used canned fava beans and chickpeas to make the salad quickly. 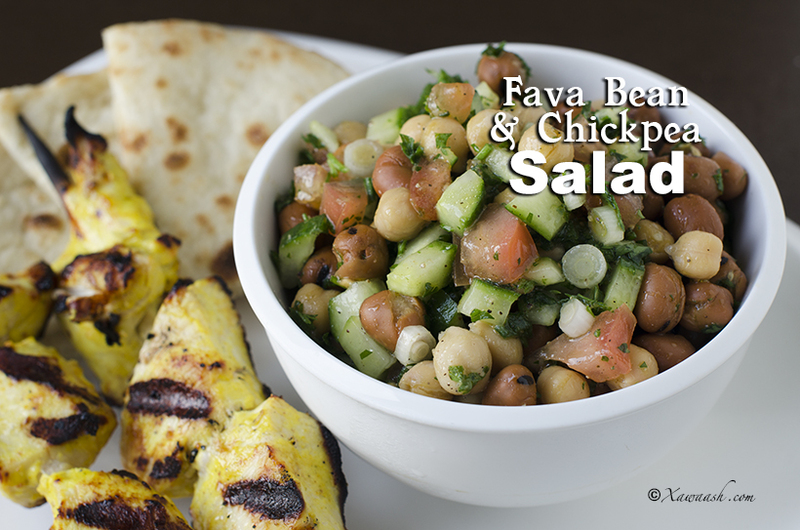 To make it extra healthy, cook the fava beans as well as the chickpeas, that is if time permits. We like to cook the beans ahead of time and freeze them which makes the process of thawing them just as fast as opening a can. You can serve the salad as soon as you finish preparing it but we found it is best to let the salad marinate for an hour so the flavours can meld. Marinate for 1 hour or serve right away. Mukawinaadka oo dhan baaquli iskugu dar. Hal saac dhig ama hore ka qaddin. Il s’agit d’une salade légère et facile que nous adorons. On peut la grignoter entre les repas, la servir en accompagnement, ou en manger un bol entier pour déjeuner. La plupart des gens n’associent pas équilibré avec délicieux mais cette salade est autant délicieuse que saine. Nous utilisons des fèves et des pois chiches en boite pour préparer la salade plus rapidement. Pour une salade la plus saine possible, vous pouvez cuire vous-même les fèves ainsi que les pois chiches, si vous avez le temps. Nous aimons cuire les fèves à l’avance puis les congeler ce qui rend la décongélation aussi rapide que d’ouvrir une boite de conserve. Vous pouvez servir la salade dès que vous avez fini de la préparer mais nous pensons qu’il vaut mieux laisser mariner la salade une heure pour que les saveurs se mélangent. Laisser mariner 1 heure ou servir tout de suite. This is an excellent healthy food. Thank you. Thank you! We are happy you like it. We wish you a very happy Ramadan. Thank you. 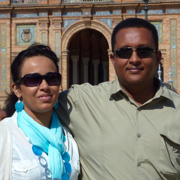 Asalama aliakum Xawaash family!! I just stopped by wish you all a very happy Ramadan!!! May allah make all your wishes come true insha’allah!! Thanks for all the great recipes. Almost everything we make for iftar is from your website. Ramadan Kareem. May you and your family be blessed with peace and happiness. Thank you very much for your comment. I made this today for a picnic, wish there was a way to send you a pic of it because I and everyone there loved it. Thanks for sharing.